Mom calls herself a “hidden child.” Although she doesn’t exactly fit into the hidden child mold, I think I agree with her. A “hidden child” is a child, often orphaned, whose identity as a Jew was kept a secret as they were sent away to be protected and raised by Christian families, or Christian orphanages, during the Holocaust. Many of these children did not learn of their Jewish identity until long after the Holocaust was over. Some may have never learned of their true identity. And only a handful of these hidden children were reunited to their Jewish families due to the high mortality rate of the Holocaust. Mom was never sent away from her family. Her mother lived in the United States when Hitler began his purification pogrom. So how could my mother be classified as one of the hidden children? Well, it does have everything to do with the Holocaust. But I think I’m getting ahead of myself. Mom is the little one in the middle. 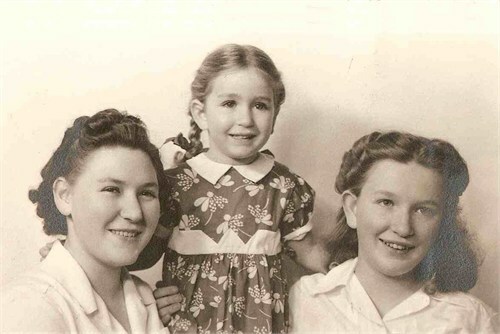 This is a good example of how Tante Leni did Mom’s hair. I think it’s adorable. Mom’s side of story comes first. Mom was born in 1940, and the war ended in 1945. She was the youngest of three girls–her closest sibling being ten years older than her. The year before mom was born, my grandmother’s sister, Leni, came to live with them from Austria. Leni was a big help to my grandparents–she took care of my mother while my grandparents ran a ranch. Mom says that she remembers Tante Leni braiding her hair so tight that she thought her eyeballs would pop out. Mom says she must have been right around five when she heard her mother crying late at night. She also struggled with Tante Leni’s strange behavior–Leni would run and hide whenever anyone came to the door; someone else would have to answer, because Leni was nowhere to be found. Mom thought it was just a weird quirk Leni had. Every springtime, relatives from San Francisco would bring matzah and other foods that her family never ate at any other time of the year. She remembers sitting down to enjoy a lamb dinner with the San Francisco relatives, but nothing was ever said about Jewish tradition. In fact, one of my favorite foods growing up was something my mom called “potato pancakes–” except they weren’t really pancakes, and mom always served them with meat. It wasn’t until I pointed out that her recipe was exactly the same as latkes (traditionally served at Hanukkah), that Mom realized she’d been eating traditional Jewish foods all her life. Mom’s family went to church on a regular basis. My grandfather was from Northern Germany. He came from a Lutheran family so his wife and children joined him on a regular basis at the local Lutheran church. When Mom was fifteen years old, Grandma invited the Mormon missionaries into the house so the family could learn more about the Mormon faith. Mom had heard bad things about the Mormons from friends at school and refused to sit with her parents and listen to the lessons. But she was curious, so she listened through the keyhole in her bedroom. Just as the second lesson was ending, Mom burst through the door and said “I want to be baptized!” Her parents were baptized along with her. Mom went away to college at Brigham Young University where she met my father. Dad was also a recent convert to the church, and had been the only member of his family to join. 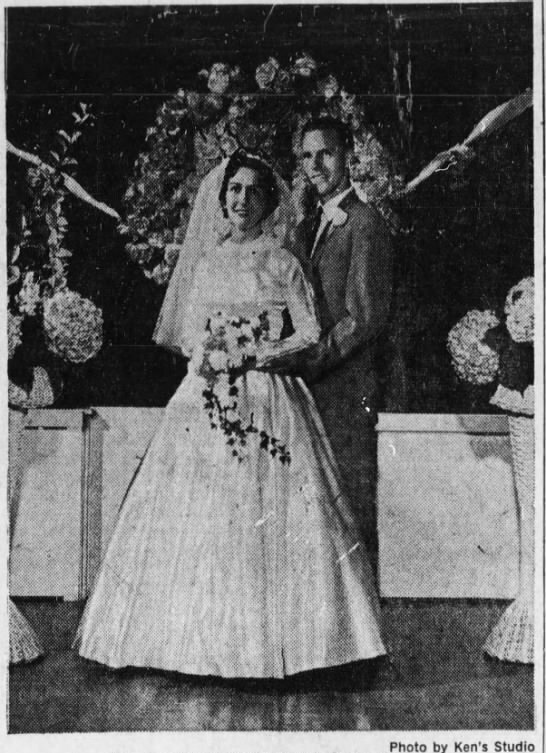 At first, Grandma was not at all sure if she could trust the man my mother had chosen to wed. She had never met my father until the day Mom brought him home to marry. Grandma had to get to know my dad as a son-in-law. Grandma loved my dad, and found it quite easy to talk to him. She told Dad things about her past that my mother never knew. After my parents had been married a few years, Dad brought a reel-to-reel recorder over to Grandma’s house and sat down with her in her kitchen. Mom says my older brother was a babe-in-arms then, and that she held him on her lap as she listened to Grandma and Dad talk. Dad told Grandma that it was time for her to open up about her past, that she owed it to her descendants to tell the truth. So grandma began to talk. She talked about how difficult it was growing up in Europe during the first world war, and how she grew up with a guilt complex because other children told her that she was responsible for Jesus’ crucifixion. She talked about the Jews being treated differently, and having it even harder than other Austrians, who had it tough too. There was very little food or money to be had, and Grandma had to scrape to earn enough money to come to the United States. She left her three sisters behind, but began saving to bring them to the U.S. too. As it turned out, she was able to come up with enough money to bring her youngest sister out of Austria before Austria was annexed to Germany, but two of the sisters were left behind. 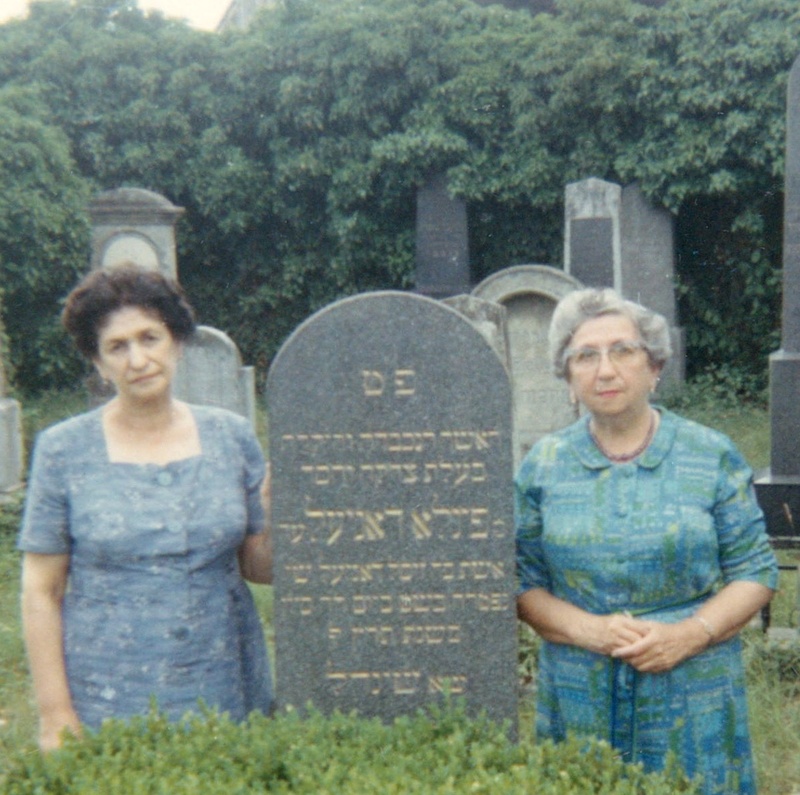 Grandma and her niece at a family grave site in Austria. Mom is very matter-of-fact about finding out she was a Jew. She was just 23 years old when she learned the truth about herself, and Grandma died just a few years later. If I have questions about it, she answers to the best of her ability, but no matter how often I ask, or how I phrase my questions, I am just not sure that I have been able to understand her feelings and emotions at the time. Mom says it was a moment of clarity for her, but she admits that even though she is very proud of her Jewish heritage, full understanding of what it means to be a Jew comes in bits and pieces. In fact, although I grew up knowing of my Jewish background, I have had to learn about being a Jew right along with my mother. So my mother counts herself a hidden child. In a very real way, she understands that her mother was a refugee every bit as much as Tante Leni was. One of Grandma’s sisters in Europe married an influential German who kept her safe through the Holocaust, but the other sister didn’t make it out alive. I don’t blame Grandma at all for hiding the truth from her children. Mom is a hidden child not because she was sent away from her family, but because her true identity as a Jew was kept hidden from her. Previous postWhat Happened to the Skeen Family? Next postWhat’s in a Surname? What an interesting experience. The terror of living in Germany and Austria in the 1930s until after the war must have been horrendous. I just finished reading 50 Children and could imagine that terror as I read. Thanks for sharing. Amazing story, Marianne. I am sure you know that as the daughter of a Jewish woman who was the daughter of a Jewish woman, you would be considered Jewish under Jewish law if you had not converted (and maybe even though you converted by some, including the Nazis). Thanks for sharing this and for sending me the link! Yes, I do know that, but I didn’t learn about it until I was in my early 30s. I am quite proud of my Jewish heritage, and consider myself a Messianic Jew.